A warm welcome to all of those just discovering Raven’s Wand! Readers frequently tell me how much they adore thunder-sprites, and so I thought I’d post a series of short articles about these wild but popular creatures. Tonight we look at Lifespan, Distribution and Flight. More to follow – enjoy! Witches and thunder-sprites have partnered up for untold thousands of years. They remain a pair from the day the witch finds a thunder-sprite and proves their worth, until either the witch dies or their lightning-staff is broken. Breaking a staff is never deliberate, as no witch would wish to be parted from their sprite, this only happens by accident or in battle. 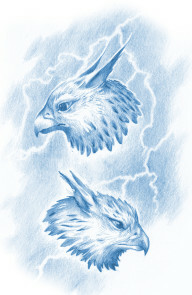 Sprites then return to the thunder-heights and their Lord, Silver-fist, where they become part of the endless cycle of rain and storm once again. They might be born again as another bolt in another place, but with a new name and likely no memory of their former life or witch. Although covens are found in all corners of the world, sometimes lightning strikes in very remote places, and the sprite will go his whole life and never see a human, let alone a witch. In these instances, he will live happily inside his tree until the day it dies, which could be many centuries, or just days if the lightning-bolt was too severe, but the line between a living tree and a dead tree is surprisingly fuzzy . . . When the tree is nothing but rotten mulch, it can be clearly argued as being ‘dead’, but some trees are cut for timber to make furniture and houses, and they can last for many centuries after the tree was felled – as can any sprite still living inside them. Skald and his fellows speak fondly of one such sprite, named Torn. No witch came to claim him, and eventually his tree was felled to make a large four-poster bed for a grand hall. Sleepers in that bed often woke in the middle of the night screaming in terror, claiming an ‘imp’ had been scuttling through the canopy. Torn might not have found a witch, but he kept his sense of humour! 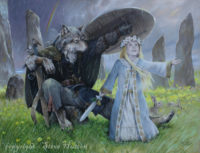 When Clovis crossed the star-sea to come to Kolfinnia’s aid, he (not surprisingly) had a lightning-staff and thunder-sprite of his own, named Torrent. Torrent lived by the same laws, and even spoke the same language as thunder-sprites here on Earth, even though he was from light-years away. He even looked identical, although his feathers were more emerald than sapphire. Here on Earth, animals quickly evolve into subspecies if separated by only a short distance, so how can creatures from light-years apart be so similar? The answer is that thunder-sprites are born from natural laws that are universal – the power of storms and lightning. There’s lightning on Jupiter just as there is on Earth and it obeys the same laws of physics. Torrent might be from a long way away, but in every sense he is a brother to Skald and every sprite on Earth. The only difference is that on Torrent’s world (which for the record is Vega), the thunder-heights are commanded, not by Silver-fist, but by a different Lord. In thunder-sprite legends, these Lords were always journeying to other worlds to meet strange creatures and even visit their sleeping dragons, just like Hethra and Halla. The reason witches and sprites originally formed working partnerships is one of those stories that’s so old nobody can get to the truth of it, although it seems every coven has its own legend explaining the origin of the witch/sprite union. One theme that remains common in every legend however, is the sprite’s love of flight. According to thunder-sprites, there’s nothing like the initial rush of streaking down from a thunderhead at supersonic speed, burning hotter than the sun’s surface, and then crashing into the earth below. It is the ultimate thrill ride. Sadly, for such action-loving creatures, if they strike a tree they’re committed to living in that tree until the day it dies (unless of course the bolt kills it), and that could be many, many years. 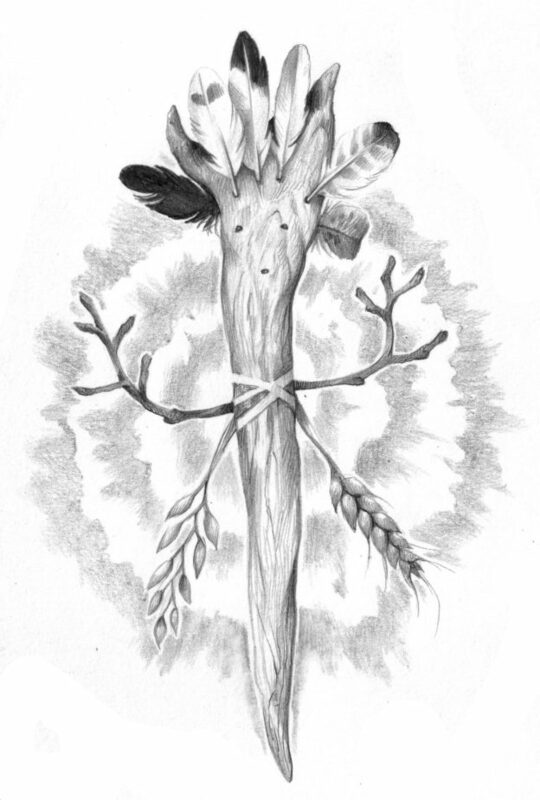 Working with witches allows the sprite a chance to escape the confines of their tree and fly frequently, and gives a witch an invaluable ally and a magical tool in the form of a lightning-staff. Thankfully for sprites, the witches that come looking for them are at that pre-adolescent age where they feel ready for anything, and are only too happy to fly hard and fast. Some things never change . . . 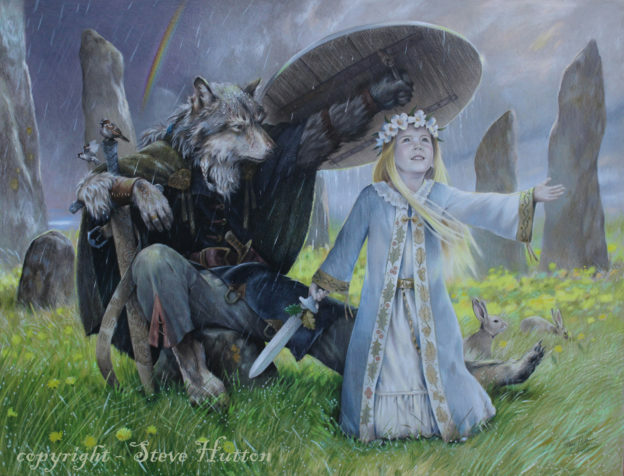 This entry was posted in Wildwood - Artwork, Wildwood - Writing and tagged Dark Raven, Dark Raven Chronicles, Steve Hutton, thunder-sprites, Wildwood on March 28, 2017 by Steve Hutton. One of the most popular character-types of The Dark Raven Chronicles turns out to be thunder-sprites, and so I thought I’d post a few words on these sparky little creatures. Witches fly. It’s written in stone, so I couldn’t get away from it, but neither did I want to. What I did want to distance my story from was the concept of ‘flying broomsticks’. I can’t express my dissatisfaction at these things without impacting on other popular fantasy serials and ultimately sounding as if I’m being critical. I promise you I’m not, but I remain steadfast in my conviction that as a narrative device, flying broomsticks are common to the point of exhaustion and also present a massive missed opportunity. So often in fantasy fiction things happen ‘by magic’. End of story. I’m more interested in exploring the logic behind the magic, even if it’s fantasy-logic, and here I could really let my imagination run wild – what exactly is the magic that allows a stick, or staff, call it what you will, fly? Years ago, living in the Yorkshire Pennines, the road to my house was steep and rocky. At one bend there was a small but tortured-looking oak tree. We dubbed it ‘ye old thunder tree’, because it looked like it had suffered a lightning blow, although I doubt it had. It got me thinking about the elemental forces that might have briefly touched it, and had they altered it in someway, other than splitting wood asunder? In channeling the storm’s energy, had the tree been left with a permanent resident, a fragment of the storm so to speak? It was easy for me to imagine that the answer was ‘yes’, and that lightning trees have a different energy to other trees. I tucked this obscure revelation away at the back of my mind, until one day I found it again and thanked my lucky stars for now having swept it out along with all the other clutter. 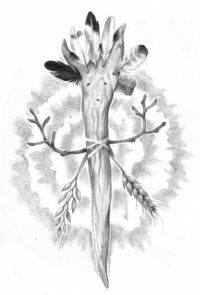 My witches needed to fly, and what better than a branch from a lightning-tree, and what better than to call it a ‘lightning-staff’! It sounded magical but credible, and it offered the reader a fresh take on a well-known theme. After that, the flood gates opened. I came up with ‘thunder-sprites’ to embody the tree’s storm force, and let them have fabulously rambling names to celebrate the storms they’d come from. Kolfinnia’s thunder-sprite is called ‘Gales-Howl-Over-Stormy-Waters’, or ‘Gale’ for short. I invented scores of sprites names, many of which are never even mentioned in full, but they’re there, such is the detail in The Dark Raven Chronicles. One of my favourites is ‘Jump-The-Cross’, named for a bolt of lightning that struck a church spire, rebounded into the graveyard below and hit a holly tree, (lightning-staffs made from holly are very rare, by the way). Although Jump-The-Cross is yet to have his day, (the name’s never been used in any of the DRC novels so far) creating these names and their stories was a pleasure. Note I say ‘his day’. I deliberately made all thunder-sprites male, as decreed by magical law. As they are born where father-thunder touches mother-earth, I saw no need for messy things like gender, hormones or reproduction getting in the way of the action. Thunder-sprites are blokes – they like wrecking things. Enough said. There was another reason I made sprites male, and that’s because the cast of witches in Raven’s Wand are mostly female, although a few male witches take supporting roles. The combination of witch and sprite made sure that any witch in the story had some other character to bounce their thoughts and dialogue off, and provides and nice contrast between female intuition and male logic. A thunder-sprite isn’t a pet, but an equal, an ally and a friend. Witch and sprite share a very deep bond, and the sprite’s contract upon this Earth lasts until the day the staff is broken or the witch dies. Suffices to say, for a witch, breaking their staff and losing their thunder-sprite is no less devastating than the death of a loved one. Also, sprites don’t remain incorporeal within their staffs, but appear regularly to bicker and banter with their witches and other sprites. 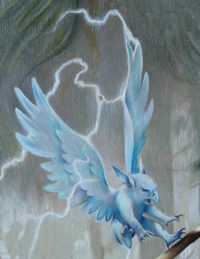 When they do appear we see them as striking raven-sized creatures similar to small primates, but winged and covered with blue feathers and bearing hawk-like heads. Sprites have a sweet tooth and can’t resist a pinecone sticky with sap. They have their own culture and social structure in the thunder-heights above, ruled over by their great Lord, Silver-fist, who’s as old as the Earth itself. Sprites are loyal but have little patience for self pity, and they’ll give their witch a kick up the rear if they think they’re slacking or failing to live up to the high moral code of witchcraft. As the action racks up in Raven’s Wand, the witches soon find that their staffs aren’t just handy for flying, but they prove powerful weapons when pitted against the Illuminata’s giant kraken steam-suited Knights. And lastly there’s the sheer thrill of flying, and not on some inanimate shaft of wood with bristles at the end, but flying in unison with a friend and a powerful natural force. Or we could just throw all of this away and say that witches fly simply by ‘magic’. I know what I prefer. This entry was posted in Wildwood - Writing and tagged Dark Raven, magic, Steve Hutton, thunder-sprites on May 22, 2016 by Steve Hutton.